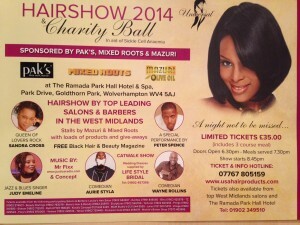 TZ Salon are taking part in the Hairshow at the Sickle Cell Anaemia Charity Ball Dinner and Dance, Saturday 20th September at The Ramada Park Hall Hotel, Wolverhampton. Hope we get loads of support from you all. TICKET & INFO HOTLINE 07767805159.